In a sea of rejection. . .
…there is a small ray of hope. This past year, I’ve committed to submitting plays like crazy because it became increasingly clear to me that my plays, unlike my children’s book, Neko and the Twiggets, will never enjoy an eternal place in the bibliographic universe. They can only truly be shared through performance, and that means–as much as we all hate it–submission, in every sense of the word. Back to my commitment this year. Because The Couple Next Door did so well (it was the second highest grossing play in Road Less Traveled Theater’s eight-year history, I was determined to send it out to as many places as possible. I’ll admit I have not been the best recordkeeper, but it’s now in the hands–or on the floors, in the closets, in the trash–of roughly 240 theaters, a result of submission from October through the present. Just to give the uninitiated an idea of the general feeling of fruitlessness that submission fosters, consider that of those, I have gotten only 25 rejections, and five requests for the script. A 12.5 percent return. And yet we all continue to do it because even if it’s not the most fun or fair game, it’s the only one. Where is the hope in this? The ten-minute play. For playwrights who aren’t household names (and sadly, many many successful–and by successful, I mean they are getting regular productions, but not rich–are only household names to regular theatergoers and other playwrights), the ten-minute play is the carrot that can keep us going. Short play festivals are cropping up all over the country, and because ten-minute plays don’t take the development time that a full-length does, nor require the same commitment from a theater, the chances of getting them produced are much greater. More than that, the top playwrights whose work gets produced with regularity as part of a theater’s season generally aren’t bothering to write and submit ten-minute plays, which means we don’t have to compete with them. The result? An email like the one I got a couple weeks ago: “Talk to me about Gift Horse.” There is nothing sweeter than such an email, one that acknowledges that not only has somebody read your play, but they’ve thought about it, thought about it enough to want to discuss it and, in this case, enough to want to produce it. And so far this year, that has happened three other times with ten-minute plays. it may not be a full-length production thrill, but it’s a thrill nonetheless. So next weekend, I’m off to New York to catch this small production of my small play, Gift Horse, at the Richmond Shepard Theater at 309 East 26th Street as part of its New Works 4 International Play Festival (and to catch another couple Tony nominees…). 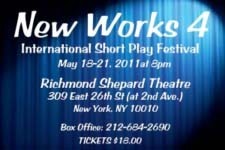 The director tells me that the cast is enjoying uncovering the layers of the piece and they are eager to meet me. I am eager to meet them, too, and to see their work–our work. Because for a playwright, this is how work is shared, with collaborators and with one audience at a time, for however long it lasts. And strangely, we like it that way. Posted in Playwrights, Productions, Theater | Comments Off on In a sea of rejection. . .